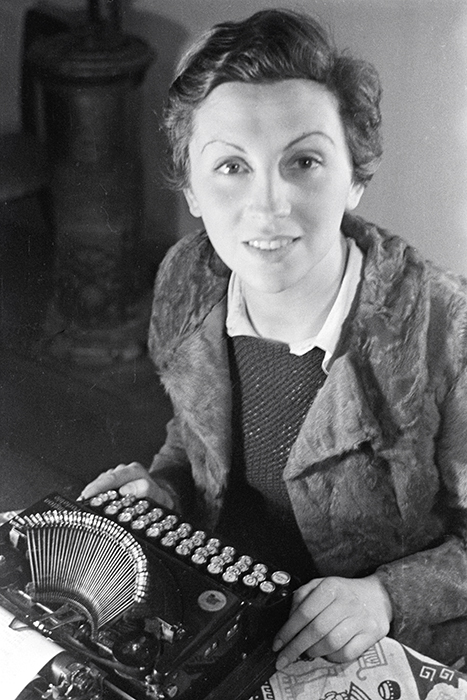 Gerta Pohorylle, aka Gerda Taro, was born in Stuttgart, Germany, on August 1, 1910. After attending the Königin-Charlotte Realschule in Stuttgart, the Internat Villa Florissant in Lausanne, Switzerland, the Höhere Handelsschule (Business College) in Stuttgart, and the Gaudig Schul in Leipzig, she had to flee to Paris in 1933, where she was first employed as a secretary to the psychoanalyst René Spitz. 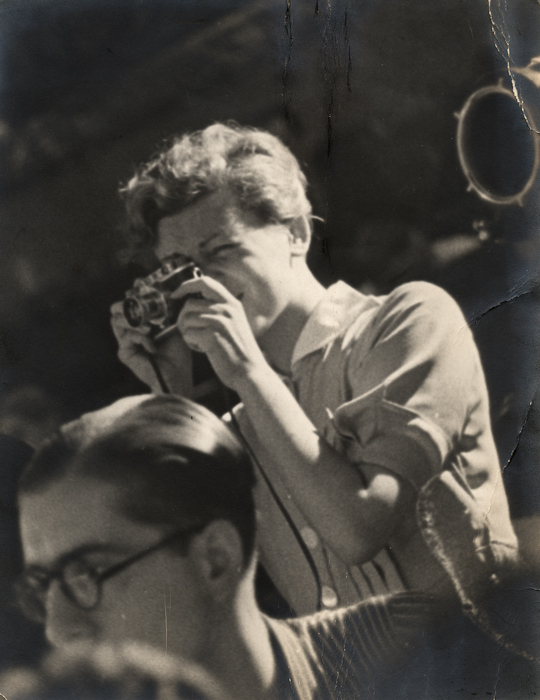 She soon met André Friedmann and started photographing; in the spring of 1936, they reinvented themselves as Robert Capa and Gerda Taro. From August 1936 on, Taro became a pioneering photojournalist whose brief career consisted almost exclusively of dramatic photographs from the front lines of the Spanish Civil War. Her photographs were widely reproduced in the French and international press. Taro worked alongside Capa, and the two collaborated closely. While covering the crucial Battle of Brunete on July 25, 1937, Taro was struck by a tank and died the next day. She was the first female photographer to be killed while reporting on war. Born Gerta Pohorylle in Stuttgart, Germany. Attends the Königin-Charlotte Realschule in Stuttgart; Internat Villa Florissant in Lausanne, Switzerland; and the Höhere Handelsschule (Business College) in Stuttgart. Moves to Leipzig and attends the Gaudig Schule. Placed in “protective” custody by the Nazi government for association with anti-Nazi political activists. In September/ October, she emigrates to Paris, where she lives near the Square de Port-Royal and is employed as a secretary to the psychoanalyst René Spitz. 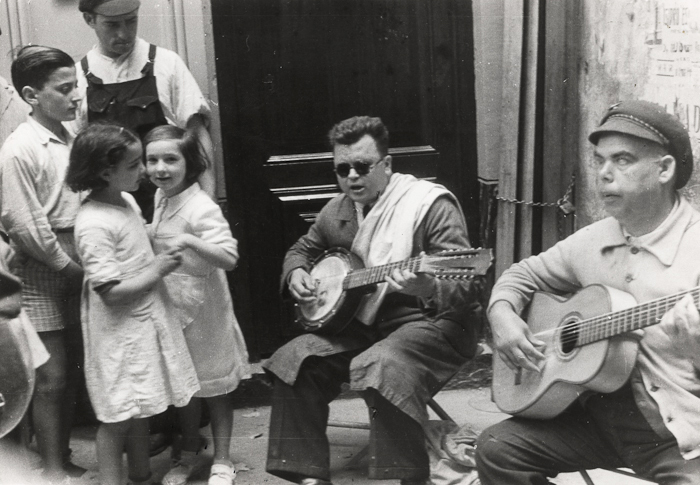 Meets Hungarian-born Endre Ernö Friedmann, who calls himself André in Paris and later becomes Robert Capa. Probably attends a clandestine meeting with the musician and educator Alfred Schmidt-Sas, with whom she was involved in political resistance activities in 1933 (he is murdered by the Nazis in 1943). Moves to the home of Fred and Lilo Stein, Rue Caulaincourt, and does some darkroom work with Fred Stein. During a camping trip to the French island of Sainte-Marguerite, André and Gerta fall in love. He begins instructing her in photography. Shortly after, she becomes a sort of business manager for André’s career as a photojournalist. André and Gerta live and work together in Paris in a small apartment near the Eiffel Tower. André’s friend Maria Eisner, founder Of Alliance Photo hires Gerta as an assistant. Gerta receives her first press card, from the Amsterdam-based photographic agency A.B.C Press-Service. André and Gerta move to the Hôtel de Blois at Rue Vavin and invent the persona of Robert Capa, a famous and successful American photographer. 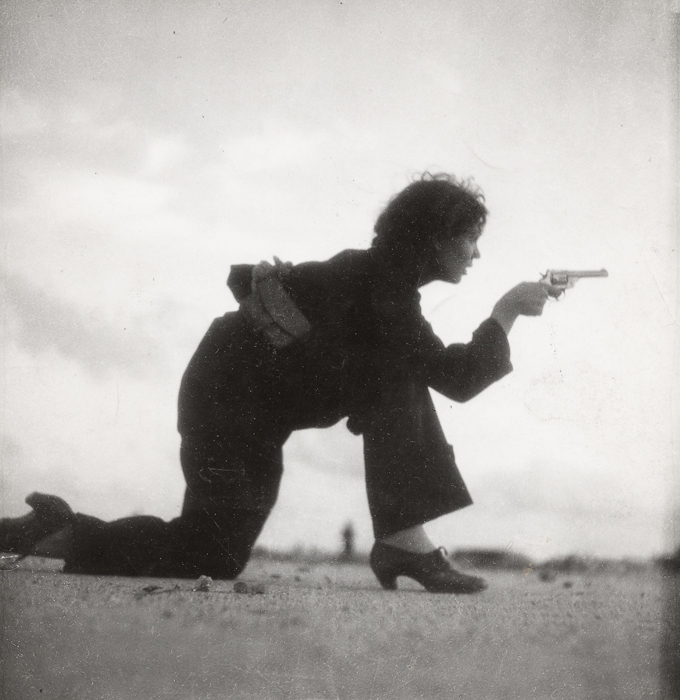 Thereafter, Gerta presents André’s work under the pseudonym Robert Capa and she adopts the name Gerda Taro. Capa and Taro cover the war in Spain for Vu, arriving in Barcelona on August 5. There Taro photographs the people preparing to defend their city, including a series of images of militiawomen training on the beach outside Barcelona. Mid-month the couple head for the Aragón front, where they stay for a week, then travel on to Madrid. A few days later, they continue south to the Córdoba front, stopping at Toledo and Alcázar. On the Cordoba front, while Taro and Capa photograph a group of Republican militiamen at Cerro Muriano, Capa snaps his most famous image, The Falling Soldier (September 5). During the last week of September, the pair return to Paris via Alcázar and Barcelona. Taro and Capa photograph a massive civil-defense drill in Paris. Taro travels to Naples to visit fellow Leipziger Georg Kuritzkes, whom she inspires to join the newly formed International Brigades. Mid-month, Capa and Taro return to Spain and photograph in the coastal town of Almería, where the streets are crowded with refugees from Málaga. In Almería, they make their series of photographs of the battleship Jaimie I and then trek along the southern front at Motril and Calahonda. Around this time, they produce an extensive photo-story on the ancient mercury mines of Almadén. They return to Madrid, where they photograph Loyalist trenches in University City. In late February, the pair begin to publish as REPORTAGE CAPA & TARO; the first major photo-story under this by-line appears in Regards, March 18, 1937. Capa returns to Paris and Taro remains in Spain; she is now under contract to the daily French newspaper Ce Soir. The couple’s romance loses momentum. Taro stays at the Casa de Alianza, an expropriated villa in Madrid used by the Alianza de Inteletuales Antifascistas. Taro begins to stamp works produced outside of her collaboration with Capa as PHOTO TARO. The change marks her growing independence from him. Taro’s work is published regularly in Regards, Ce Soir and Volks-Illustrierte. She covers the Battle of Guadalajara (March 8-23), witnessing the Loyalist victory over Mussolini’s troops and producing the first major reportage to be published as PHOTO TARO (Regards, April 8, 1937). 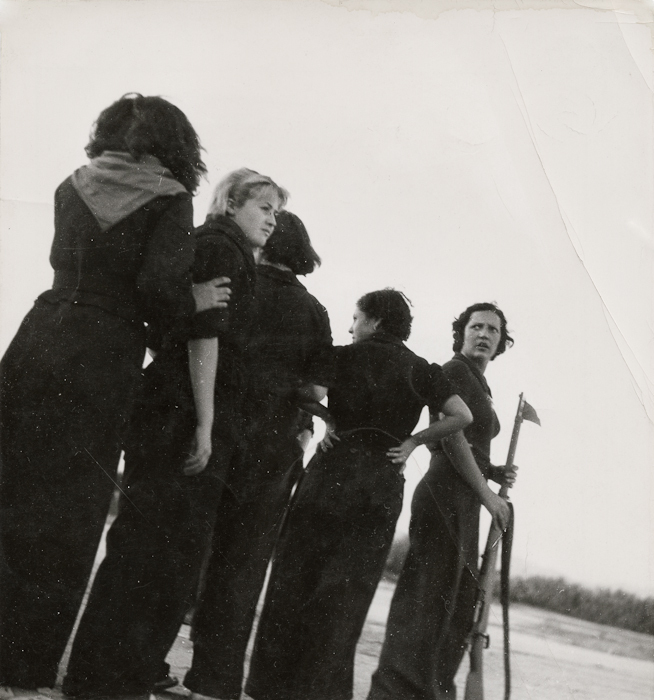 She also photographs on the Jarama front, then travels to Valencia to cover the new People’s Army. She returns to Paris and photographs the huge funeral of the victims of a police raid at Clichy. Taro and Capa wait in Paris for authorization papers for an assignment in Bilbao. By mid-month, they are back in Madrid, Taro travels to the Jarama front and visits the crew of The Spanish Earth, a documentary film by Joris lvens. The couple stay at the Hotel Florida in Madrid, where they keep company with Ernest Hemingway, John Dos Passos, and Herbert Matthews from the New York Times. By April 22 or 23, Taro and Capa are back in Paris. During the May Day demonstration in Paris, Capa photographs Taro buying some lilies of the valley (a picture from that series will later be used for the dedication in Death in the Making). Capa goes to Bilbao. Taro also returns to Spain and is already in town when the fascists begin bombing Valencia on May 14. She travels solo to the city to photograph the results of the nightly attacks on the civilian population. At the end of the month, she meets up with Capa and they travel together to the Navacerrada Pass outside Segovia, where they photograph the Loyalist offensive made famous by Hemingway in For Whom the Bell Tolls. 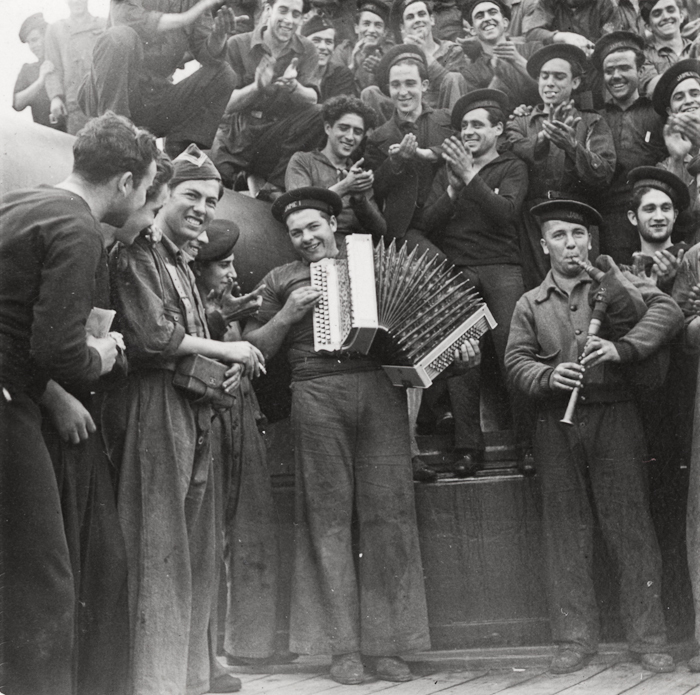 Taro and Capa return from the Segovia front and photograph and film in and around Madrid, including a series on workers in a munitions factory. In Carabanchel, a working-class suburb of Madrid, they photograph and film a series on the dinamiteros. On June 16, they cover the funeral of the Republican general Lukacs in Valencia. On June 24 they arrive at the headquarters of the Chapaiev Battalion in Peñarroya on the Córdoba front. Capa films and Taro photographs a reenactment of the battalion’s victory over the fascists at La Granjuela. At the end of June, Taro photographs some fascist deserters near Blasquez. Taro and Capa cover the opening of the Second International Congress of Writers for the Defense of Culture in Valencia on July 4. 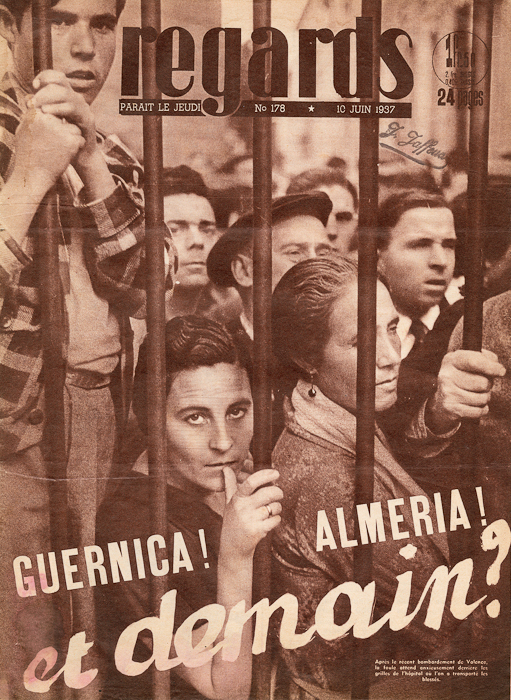 Capa returns to Paris while Taro follows the congress to Madrid and resettles at the Alianza. She covers the Battle of Brunete (July 6), west of Madrid, proving with her pictures that the Republicans have captured the town. On July 7, she rejoins the writers’ congress for an excursion to the Guadalajara front. Back in Paris for a brief vacation, she celebrates Bastille Day with Capa. She returns to Madrid a few days later, then travels with Ted Allan to a battle site located between Villanueva de la Cañada and Brunete. There, on July 25, one day before her return to Paris, Taro and Allan find themselves in the midst of a panicked retreat. They jump onto a moving car and are both hit when a Loyalist tank crashes into the car. Taro dies early the next morning in a field hospital of the 35th Division at El Escorial. She is the first female photographer to be killed while reporting on war. Taro’s body is laid out at the Alianza in Madrid. Writers, artists, and military delegations pay their respects. The next day, her body is transported to the Alianza in Valencia, where Rubio Hidalgo, chief of the press bureau, delivers the official condolences of the Republican government. The writer Paul Nizan escorts Taro’s coffin to Paris, where the French Communist Party (PCF) declares her an antifascist martyr. Taro’s body is laid out at the Maison de la Culture in Paris. After securing a burial plot for Gerda Taro in Père Lachaise cemetery, the PCF holds her funeral on the day that would have been her twenty-seventh birthday. Female Photographer Fridays is an occasional series that highlights the work and life of female photographers, published on Fridays. 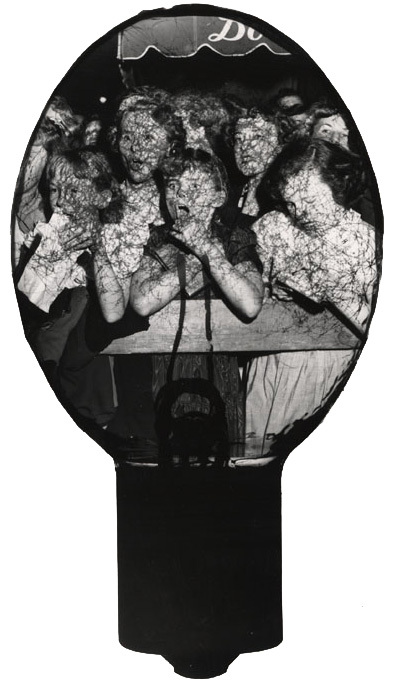 This entry was posted in Fans in a Flashbulb and tagged Female Photographer Fridays, Fred Stein, Gerda Taro, Madrid, photojournalism, Regards, Spain, Spanish Civil War, war. Bookmark the permalink.